You are currently browsing the tag archive for the ‘brew’ tag. A year ago, I packed up my grungy 10 pot coffee brewer and made the switch to plunger style brewing with a glass French press. To a true coffee aficionado, the difference was euphoric. The French press let me brew the highest caliber, freshest, and best tasting coffee right in my kitchen. When it came time to plan the food list for our next camping trip, I was not enthusiastic about the usual instant coffee we bring on our trips. I wanted to bring my French press with me and make some truly worthy coffee, but a glass French press seemed doomed to break out on the trail for sure. My search for an answer came quickly. I’d heard of a backpacker’s press and found what I was looking for on the internet with a company called Planetary Designs. 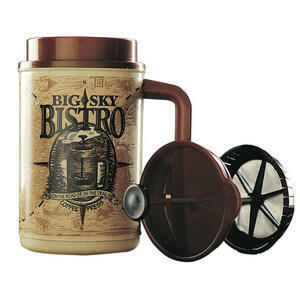 The Big Sky Bistro, the original French Press Mug, was designed by a backpacker and coffee connoisseur who had faced the same dilemma I was in and had envisioned this product as the answer. Big Sky Bistro is an insulated French Press Mug that brews a perfect cup of coffee, and keeps it hot as you drink, all in the same container. Admittedly I was initially concerned about the durability of the product; it is a plastic insulated mug, and the plunger is also constructed of plastic. I wondered if it would hold up. My interest in this product was for occasional use and by no means did I think I would use it everyday. My trip wasn’t for a couple more weeks and I was anxious to try it. The ease and convenience of brewing my morning tonic in the same mug that I walk out the door with was as exciting as the gratification I had when I switched from my electric brewer to the French press. I brew a full 16oz. of perfect coffee each morning in my Big Sky Bistro and have now used it everyday straight for two months. My concerns of durability were not necessary; this mug was built to hold up to the conditions of the trail and the continuous abuse of the daily grind. Special thanks to Richard Tinnell for his contribution of this article.